NASA’s Kepler Space Telescope has detected 461 new potential alien planets, including four worlds slightly larger than Earth that may be capable of supporting life as we know it. The 461 newfound candidate exoplanets, which were announced today (Jan. 7), bring Kepler’s total haul in its first 22 months of operation to 2,740 alien worlds. Only 105 have been confirmed to date, but scientists say 90 percent or so should end up being the real deal. Four of the new candidates are “super-Earths” — planets 1.25 to 2 times as big as our own — that orbit in their stars’ habitable zones, a range of distances where liquid water is possible on a world’s surface. One of those four is just 1.5 times the size of Earth and circles a sun-like star, researchers said. Some have suggested that Stephen Spielberg’s classic UFO film, Close Encounters, launched the image of the Grey alien into popular consciousness and that this is what accounts for the preponderance of “Grey” sightings in recent decades. There were certainly reports of extra-terrestrials matching the Grey description before this, however. Barney and Betty Hill, two of the more famous ET abductees, claimed to have been whisked away in a UFO by aliens matching the Grey description, who then performed experiments on the couple before erasing their memories. Only hypnosis allowed the two to remember what had happened. Betty Hill later drew a star map which she said one of the aliens had shown to her when she asked where they came from. This was later identified as corresponding to the Zeta Reticuli star system, leading many to believe that this is the home of the Greys. Some of those who claim to have seen alien bodies, either stored in secret military facilities, or at the scene of a UFO crash – such as that in Roswell, New Mexico – have offered descriptions of the corpses which correspond perfectly to that of the Grey alien in UFO contact reports. Gordon Cooper was one of the astronauts aboard America’s first manned mission in space. In later years, he became known for his frank views on the UFO subject. Cooper said he had seen UFOs several times in the course of his life. None of these sightings occurred during his spaceflights, it should be pointed out; they all took place during his earlier career as a military pilot. Cooper mentioned seeing a flight of metallic discs flying over a US Air Force base in Germany. 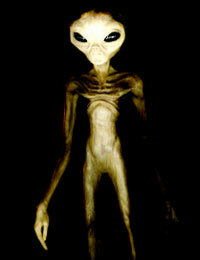 He even claimed to have filmed a UFO landing in 1957, this time at Edwards Air Force base in the United States. Cooper and a camera crew had been tasked with developing a new landing system at the base. As they shot film, a flying saucer was spotted. Naturally, the camera crew focused on it as it drew closer, extended some landing gear and landed on a dry lake bed nearby. They crept up on it, filming all the while and managed to get to within 20 to 30 feet before it took off again. Cooper reviewed the film and confirmed that it showed everything that had happened. Then he was ordered to send it in a sealed bag to Washington. It was never heard of again. This was not to be Cooper’s only experience with having film he took mysteriously confiscated. When he returned from one of his space missions, he found that some of the images he took from orbit were confiscated too – because he had photographed Area 51! Posted on January 8, 2013, in Uncategorized. Bookmark the permalink. Leave a comment.